After last week's court decision striking down the Federal Communication Commission's net neutrality rule, it is worth taking a moment to remember that a world without net neutrality—the principle that the company that connects you to the internet does not get to control what you do on the internet — is a world that is bad for everyone who does not own stock in major Internet Service Providers (ISPs). Any time things change so that ISPs are in a position to decide what succeeds and fails online, everyone else is going to lose. That being said, a world without net neutrality is especially bad for gamers. Because a huge part of gaming is about pushing the limits of what is technologically possible. Gamers use the internet in ways that seem "cutting edge" to many people, but that inevitably becomes mainstream a few years later. From the original MUDs to MMOs to Cloud Gaming, the gaming community has always been on the forefront of the technological adoption curve. Unfortunately, that strength can also become a weakness. Since game technology is so dependent on pushing boundaries, ISPs can impact gamers in ways that aren't necessarily immediately obvious to the non-gaming internet masses. What does this look like in practice? Today, the most obvious examples are the significantly larger-sized game downloads offered through the new consoles' digital storefronts. Thanks to improvements in texture resolution, detail maps, and lighting, games on the Xbox One and the PlayStation 4 can easily be 4-6x the size of those from last gen. In real-world terms, this means we are seeing Day 1 games hitting 40-50 GB in size (just wait until we get to "multi-disc"-sized downloads! ), as well as a recent game update being 13 GB in size! All of a sudden monthly data caps of 150, 200, or even 300 GB per month—caps that, even ISPs admit at this point, have nothing to do with network congestion—start to become problems. ISPs may insist that their caps only impact the so-called worst of the worst, but at the same time they refuse to detail how caps were set, how many users are affected, or how the percentage of affected users is changing month over month. They can't even accurately measure how much data people are using. Without that transparency, we're stuck taking their word that data caps won't soon impact the entire gaming community. Another area of concern is latency—how quickly your game data traverses the Internet. Depending on the game, latency may be the difference between killing and being killed. If you and your opponent see each other at the same time, there's a good chance that the one of you with lower latency will live to tell the tale. 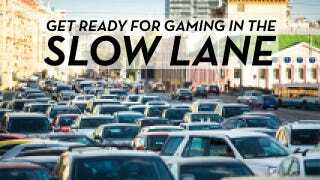 While latency has long been important for action-based games (one of the reasons for dedicated servers), latency is poised to become much more important as this next generation of consoles explores cloud gaming, especially through online game streaming from services such as PlayStation Now. Your experience will differ depending on the type of game, but in general streaming video games are highly dependent on low latency to deliver responsive control and interaction. Even today we are seeing mixed messages about the latency offered by early PlayStation Now games (in spite of Sony's admirable attempts to reduce this in areas they control)… and that's with the streaming server being located in the same building! Beyond traditional latency-sensitive online games, latency will also be a key factor determining the quality of the streaming game experience—whether single or multiplayer. You may be one of those gamers who argue about the difference in control responsiveness (or latency) between 30 and 60 Hz games; internet latency has the potential to be an even greater factor in that experience, whether from missed shots to laggy controls and screen updates. For better or worse, latency is a factor that can be hugely impacted by decisions that ISPs make. Reducing latency is hard, so it would be much easier for ISPs to let latency drift upwards—especially if it gave gamers a reason to pay extra for a special "low latency" connection that can be monetized. And finally, what if you happen to be one of those crazy gamers who actually watches television too? A consumer who chooses to consume their 34 hours of weekly television via over-the-top services will end up watching around 136 hours a month. At 2.3 GB/hour for HD streaming, this viewer will consume around 313 GB of data a month with television viewing alone. That seems like a lot, but it may actually be an underestimate. Using numbers submitted by Comcast to the FCC in 2010, an average household can expect replacing cable TV with online video to require 648 GB of data per month. Remember, that doesn't include any other traditional uses of bandwidth: music streaming, web surfing, email, online backups, video chats, etc. That doesn't include the new impact of huge next-gen video game downloads and updates. That doesn't include bandwidth consumed by game streaming services such as PlayStation Now. And finally, we can't forget that that's all for a single consumer in a household. What happens when you multiply all of this bandwidth use by some factor (2x? 3x? 4x?) to cover a family or multiple users in the home? It's Not Just About Gaming — Streaming Video Counts Too! Americans watch 34 hours of TV a week on average. 40% of subscribers to fixed broadband services (such as Comcast's cable) access at least some "over-the-top" video services such as Netflix, Hulu, or Amazon. However, for those under age 35, the figure jumps to 70% — and 13% of that demographic stream all of their TV, and don't access cable or broadcast TV at all anymore. If ISPs are allowed to interject themselves into the free flow of the internet, and gamers are an easy target, how might that actually work? Well first, ISPs might impose some sort of artificial restriction on the network—low data caps, or high latency for example. Then, they might choose to exempt some of their own services from that restriction. This is not hard to imagine. AT&T owned a percentage of the gaming service OnLive. OnLive, with its live streaming of games, was both data-intensive and latency-sensitive. Exempting OnLive from AT&T's data cap, or giving OnLive special latency prioritization, would have made it much more attractive on AT&T's network than non-owned competitors. One can also easily extend this thinking to a hypothetical example of what a current console provider might do with their own streaming game service as well, potentially paying for prioritization so as to deliver a better experience to their users, while causing competitors to suffer comparatively in the same space. If your console provider is on the wrong side of an ISP alliance, you're stuck. To be clear, one shouldn't necessarily blame the game service or console provider here. They're public companies. They have to do what appears to be the right thing financially for their investors. Not to do so could literally expose them to lawsuits. That's why rules preventing ISPs from offering this type of service in the first place are so important. This type of ISP self-dealing is not just a hypothetical. Over in the video world, we have already seen Comcast exempt its own online video service from data caps it imposes on customers. Specifically, Comcast is exempting its Xfinity streaming video services from its data cap, while counting the bandwidth consumed by competitive over-the-top services such as Hulu and Netflix against it. And to be clear, this is on the same console in the same house using bandwidth delivered over literally the same line into the house. In a world with low data caps, that exemption makes it look artificially attractive when compared to Netflix, Hulu, Amazon Prime Instant Video or other services pushing you towards your cap. When ISPs start giving advantages to their own services, the critical path for new startups becomes depressingly obvious. The new cost of success is letting an ISP buy a chunk of your business, and hence having the ability to influence your plans or direction. Or perhaps you have to let all of the ISPs buy a chunk of your business, since you want to make sure that it works everywhere. Some might be wondering what the big deal is? If, one ISP hits a gamer with data caps, or another fast-tracks Xbox Live data when the consumer has a PlayStation, what's to stop the gamer from jumping ship to an alternate ISP? Simply put, lack of options. In 2010, the FCC found that 96% of Americans have "at most" 2 wireline broadband providers. But even those two providers come with a huge asterisk. Starting in 1999, the FCC defined "broadband" as being faster than 200 Kbps — that's 0.2 Mbps. In 2010, at the time of the competition finding, it revised that threshold up to 4 Mbps down and 1 Mbps up. That means that when the FCC — and most existing ISPs — talk about broadband competition existing, they are talking about competitors who offer a 4 Mbps connection. That 4 Mbps won't be enough to support Playstation Now, and would cry for help if two people tried to watch Netflix at once. That means that many people don't really have an option. If their fast connection to the internet starts to have issues of any sort, they are pretty much stuck with it. But you don't have to take the FCC's (or our) word for it. ISPs remain hugely profitable even though Comcast, AT&T, and Time Warner Cable all made it into Consumerist's final 8 worst companies in America. Those fat margins and customer dissatisfaction (to put it mildly) would easily attract competitors if entering the market was easy. Fast Lanes, Slow Lanes — or — The Internet Superhighway Now Has Toll Gates? Of course, ISPs don't necessarily have to own services to impede competition. They can just set up special toll gates on the lanes that make the internet actually work. This, in essence, is the deal that AT&T announced two weeks ago. AT&T's special mobile data cap—a cap they admit is all about charging content providers, and not managing network congestion—makes it hard to do a lot of things online. Their proposed solution? Give services the "option" to buy their way around the cap. AT&T is in the fortunate position to be able to create a problem and sell a solution. Why waste revenue improving your network when you can impose low data caps and then charge people to get around them? That way, you get to pocket the subscription fees and the fees you force creators to pay in order to reach your subscribers. In this case, the result of the solution is that any service that wants to compete has to pay AT&T an extra fee. Of course, that fee doesn't just appear out of nowhere. There's now a new, real cost that a provider (such as a gaming service) must cover, and that cost will obviously be passed on down to users through higher fees or other upcharges. Because this cost is semi-hidden to users, it is easy for AT&T to increase it. If this dynamic feels familiar, that's because it is how your cable bill got so high. Of course, that assumes there are new services with users; small startups may never be able to buy their way into the exemption in the first place. AT&T is the first ISP to announce this, but you can be sure that it won't be the last. After all, when it was arguing against the net neutrality rules Verizon memorably told the court that "but for these rules" they would be exploring just these types of special "commercial arrangements." Now that the rules are gone, you can be sure that Verizon—along with other ISPs—are working on their own special deals for creators as well. But ISPs Claim They Won't Do Any Of This — or — Why Worry? In the wake of last week's net neutrality decision, many ISPs have come out with statements promising that they love net neutrality and would never do anything to violate it. One option would be to trust them. Another would be to take a look at their history. And while you look this list over, keep mind that most of these entries occurred under some sort of net neutrality rules designed to discourage this type of behavior. 2005 — North Carolina –based ISP Madison River Communications blocks VoIP service that competes with its own phone service offering. Only stops after FCC intervenes and issues a fine. 2005 — Then-A&T CEO Edward Whitacre makes it clear how ISPs see internet services by declaring "Anybody who expects to use pipes for free is nuts." 2007 — Comcast blocks the entire bittorrent protocol. When the blocking is discovered, Comcast lies about it until the FCC steps in and forces Comcast to come clean. 2010 — Verizon tries to cut a deal with Google to exclude large parts of the internet from net neutrality protection. 2012 — Comcast exempts its own online streaming video service from the caps that all competing services count against. 2012 — AT&T decides to block FaceTime for some subscribers unless they change data plans. A threat of a net neutrality complaint convinces AT&T to back down. 2013 — When asked if Verizon wanted to charge websites to reach Verizon subscribers, Verizon assures the DC Circuit Court that "But for these rules" they would already be looking into such arrangements. 2014 — AT&T's "sponsored data" scheme gives websites and apps the "option" of paying to get around the data caps that AT&T imposes on its subscribers. No one is going to pay to get into a fast lane if the slow lane is good enough for their needs. As a result, a world without net neutrality is a world where ISPs have a massive disincentive to keep improving their "regular" service. If people are paying a huge amount to buy their way around data caps, why would you ever raise them? If latency concerns are driving companies into partnership agreements, why improve latency? Why spend money on your network when you can just keep it? Over time, this dulls the cutting edge of technology that gamers rely on so much. It shrinks the pool of companies that can offer truly competitive games and services, and even reduces the opportunity for independent game developers to create the sorts of new and unique games we love. And finally, it raises the cost for you to get access to those games that had to pay to get access to a working internet. For years, the FCC has avoided Public Knowledge's requests to gather simple information on data caps: How and why are they set? Once they are set, are they ever evaluated? Is there any mechanism for caps to increase over time? This summer, the FCC's own special Open Internet Advisory Committee got into the game. It told the FCC that since the FCC had not collected any data, the Committee could not even begin to come to a conclusion about data caps one way or another. The FCC's response? So far, nothing. A world without net neutrality is bad, but it is not inevitable. Net neutrality can come back in a number of ways. The FCC can appeal last week's court decision. It can reexamine how it created the rules to make them more acceptable to the court. Congress could step in and re-empower the FCC to protect an open internet. A week after the court decision, all of these options are on the table, and all of them can be done at the same time. But none of them will happen if no one in Washington feels pressure to act. Fortunately, there are a lot of you. Collectively, gamers, along with online filmmakers, television viewers, app developers, schools, and everyone else who relies on an open internet, cannot be ignored. That means it is worth taking a little time to start thinking about net neutrality. Read up and tell your friends why it is important. Because we're going to be asking for your help soon to make it abundantly clear to everyone—Congress, the FCC, and ISPs—just how important net neutrality is to you. So keep checking Kotaku—we'll be hanging out in the comments and responding as possible. And if you want more, sign up for Public Knowledge's email list, follow us on Twitter, or Like us on Facebook. When the call goes out, the open internet is going to need all of you. Michael Weinberg is the vice president of Public Knowledge, a consumer-advocacy group in support of an open internet. Andre Vrignaud, a veteran of Microsoft and Amazon, is a consultant for the digital entertainment industry. Since 2001, Public Knowledge has been fighting for an open internet, balanced copyright, and the rights of consumers to use innovative technology lawfully in Congress, in the courts, and in front of agencies such as the FCC. Public Knowledge regularly files with the FCC on behalf of consumers to stop or curtail abusive ISP practices and is a recognized leader in advocating for an open internet in Washington, D.C.